Sequestered amid the pricey flora & fauna in Urban Outfitters’ newly opened Devon Yard, Amis Trattoria is companioned by Anthropologie, which includes BHLDN wedding brand, Terrain – a garden shop, outdoor living repository, house & home emporium, gift boutique, wedding venue, and the Terrain Café – as well as a private event space and central courtyard. Urban Outfitters prides itself on the construction of a distinctly pastoral setting at its Devon Yard project. 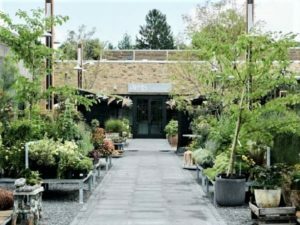 The various structures incorporate local materials, field stone and reclaimed barnwood, etc., and feature vernacular and greenhouse (Terrain Café) styles. There is no question that the Yard’s exterior architectural design is striking in its simplicity. That being said, once across the threshold, you soon realize that Amis has its own unique design dilemma: The restaurant’s minimalistic industrial chic décor is an absolute acoustical nightmare. Just check out the bar area (pictured); the high ceiling… hard surfaces (including a hardwood floor)… the lack of tablecloths, window dressings and other sound retardant materials all conspire to turn the space into a decibel-driven tsunami, enveloping patrons in ebbs and flows that vary from annoying to downright unhealthy. Even when partially occupied, the sound reverberates like a broken chainsaw – and the regular dining room is no improvement… Don’t say I didn’t warn you. … But on to the food. The menu is quite interesting, for a variety of reasons. First of all, there’s a bit of everything here… a tempting array of antipasti, salads, pizzette (individual pizzas), pastas, entrées, and several excellent side dishes, especially if you are of the vegetarian persuasion. On the other hand, the main course selections are extremely limited and, even though Amis made its debut on August 16th (2018), several of the offerings seem infinitely more suitable for dining in the bleak midwinter. I mean, when the heat index tops the 100-degree mark, as it did during several visits, heavy items such as Pork Chop Parmigiana, Porcini Rubbed Lamb Chops and New York Strip Steak tend to lose their appeal. Even more importantly, however, is the fact that the food at Amis is somewhat unpredictable. A foolish consistency may very well be the hobgoblin of little minds, as Emerson so aptly put it… but it is the absolute sine qua non of a successful restaurant. To put it another way, ordering from a menu should not be like playing Russian roulette – Urban Outfitters, please take note. Not that the food is bad per se… problem is, you never quite know what to expect. Take the Seared Scallops, for example. The bivalves are served up on a seabed of charred corn salad and fregola, which is a type of pasta from Sardinia that closely resembles the shape and texture of couscous. 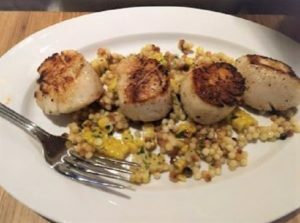 An intriguing combo that works well with the meaty consistency of the scallops. On one occasion, the scallops were nicely seared (pictured), just a shade past golden brown, and firm & opaque at the sides… On another visit, however, they were barely singed and on the mushy side. Conversely, the Whole Roasted Branzino (European sea bass) was perfectly prepared, moist, flaky and packed with flavor. 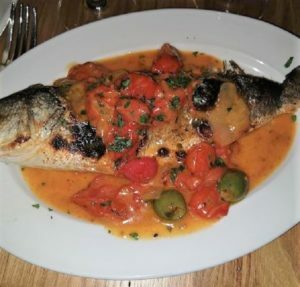 Branzino has become something of a staple on Italian menus; it is usually roasted whole and then filleted tableside, which, in many cases, is nothing more than a needless bit of showbiz. And the problem with this method of presentation, of course, is that by the time your server finishes separating fish from bone, your filets are lukewarm at best. Amis has ameliorated this difficulty by doing the dirty work in the kitchen and then presenting the complete package with olives and tomatoes. Kudos to the chef. Other items were hit or miss. The Porcini Rubbed Lamb Chops could only be described as “tasteless,” and the Swordfish Meatballs as less than stellar. The starter of Eggplant Caponata Bruschetta was very good… but its kissin’ cousin, Bufala Ricotta Bruschetta, was the bland-leading-the-bland… ditto the Jersey Corn and Tomato Salad. The ratatouille-like Charred Seasonal Vegetables – eggplant, peppers and zucchini – were quite enjoyable but on the oily side. 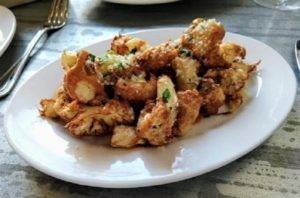 On the other hand, the Crispy Potatoes, Crispy Brussels Sprouts, and the especially flavorful Crispy Cauliflower sprinkled with pecorino and splashed with a zippy salsa rosa (pictured) were all excellent. 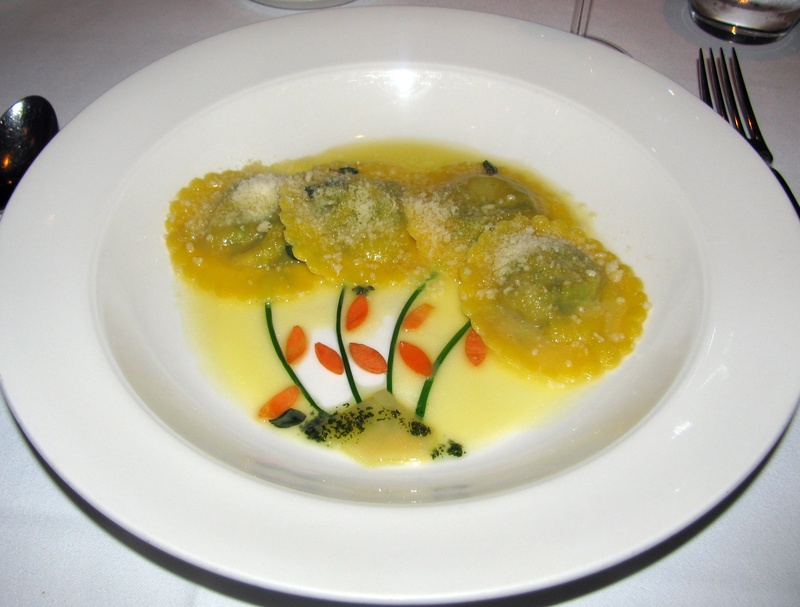 Other than the items noted favorably above, your surest chance of gastronomic satisfaction lies with the pasta dishes, which, in my opinion, are in a class by themselves; carefully prepared and attractively but simply presented. Possibilities include the Ricotta Ravioli with tomato and basil, Fettuccine with charred corn and scallions, Bucatini (a tubular dried pasta slightly thicker than spaghetti) with jalapeño and almond pesto, Paccheri (in the shape of a very large smooth tube, originating from Campania) with swordfish, eggplant and pine nuts, and Rigatoni Bolognese. My nod, however, goes to the Tonnarelli “Cacio e Pepe” (pictured). 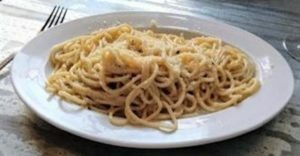 Cacio e Pepe is a pasta dish from Roman cuisine and literally means “cheese and pepper” in several central Italian dialects. As the name suggests, the ingredients are very simple and include only black pepper, Pecorino Romano cheese, and pasta (butter and olive oil may also be included, depending upon the recipe). When preparing the dish, some of the hot cooking liquid is left with the pasta, so that the heat melts the cheese, while the starches in the water help bind the pepper and cheese to the pasta. Tonnarelli is a spaghetti-like pasta originating in Lazio. The dish may not look like much, but it is sublime in its apparent simplicity and exceedingly flavorful. 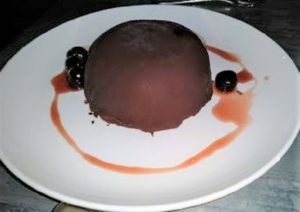 For dessert, be sure to try the Tartufo. The word means truffle in Italian, but it also refers to a special Roman dessert created at Tre Scalini restaurant on the Piazza Navona. It is a ball of dark chocolate ice cream encased in a chocolate shell with bits of chocolate and candied sour cherry in the middle. The representative proffered here is quite acceptable and certainly suitable for sharing … it just needed more time for the ice cream to thaw a bit. 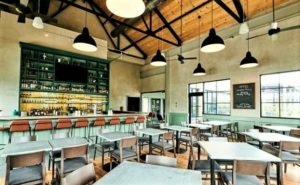 At the present moment, Amis Trattoria is the place to be, so expect a youngish, decidedly boisterous crowd with a generous sprinkling of Main Line cougars added to the mix (If you’re a people-watcher, you’ll have a field day! )… which brings up another issue – parking. Right now, with just the restaurants and retail outlets operating, prime time parking can be difficult; when there are special events (weddings, etc.) scheduled, I have no doubt that the parking issue could very well become a parking “nightmare.” Just be prepared. Given the hit or miss quality of the cuisine and service, the prices (not out-of-sight but significant), the elevated decibel level, the madding crowds, and the parking aggravations, is dining at Amis really worth the effort…? Well, maybe just once… On the other hand, it’s strictly your call.